A couple of years ago we showed you the PackIt freezable cool bag designed to keep food fresh for hours even in hot weather. Now the same company, TrendyKid, has launched a smaller version, understandably named the PackIt Mini. It has a slightly smaller capacity of 4 litres, and measures 8x8x3 inches when open and 5x8x3 inches when folded. When tested on a US TV show, it was shown to perform better than some other portable food storage methods that didn’t involve refrigeration or freezing, keeping food contents 20 degrees F cooler and inhibiting bacterial growth. 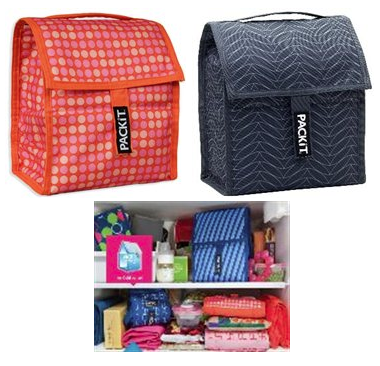 PackIt Mini is lined with a freezable gel and can be kept in the freezer ready for use. It promotes healthy eating and reduces waste. Items which might not be suitable for a standard lunchbox can be packed and kept cool, and because it can stay cold for up to 10 hours, leftovers can be safely put back in the fridge at home for eating on another day.